Berlin-based indie natural brand April Aromatics has launched Irisistible, a new iris fragrance. [...] The Iris flower represents royalty and nobility and was considered to be a symbol of kings and queens for hundreds of years. This perfume contains the sweetest yellow Iris Pallidia from Italy; it is joined by white Jasmine Grandiflorum from India, red Rose absolute from Bulgaria, yellow Lemon from Italy, white Tuberose blossoms from India, a touch of orange Cassia from Sri Lanka, rounded up in a base of golden Sandalwood and many more. 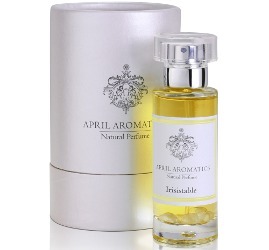 April Aromatics Irisistible is €201 for 30 ml Eau de Parfum. I don’t know what to think – has anyone sampled this? An Iris fragrance always grabs my attention…I would love to sample this. She is selling samples, but even the samples are expensive…all natural aged iris is expensive stuff. Yikes, that is pricy. Would love to sample it tho.